Share a meal with hungry Oklahomans by making a tax-deductible donation. To make a donation online enter a dollar amount and you will be taken to a secure payment processing screen. Please make your check payable to BritVil Community Food Pantry and mail it to PO Box 14755 OKC, OK 73113. You can also donate food at our location above Monday-Friday 9:00am-11:00am. Food must be sealed and not open in any way. The BritVil Community Food Pantry thanks you for donating. Items pictured are representative of the foods most needed by the Food Bank. 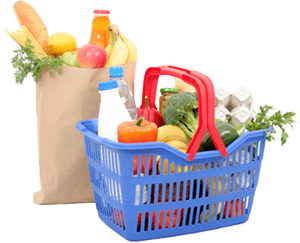 Your generous donation is tax-deductible and will be used to support the operational expenses of the BritVil Community Food Pantry as it strives to achieve its mission to harness food and non-food essentials for the needy people of Oklahoma City.